I thought it was a little strange that Survivor’s “Eye of the Tiger” was blasting from Angel Fire’s loudspeakers at 9 a.m. on a Saturday morning. Then came the onesies. Everyone was wearing skintight ski suits adorned with spiderwebs or flames—and those without Spandex sported full-body astronaut getups. What really threw me off, however, wasn’t the eccentric attire but the equipment on their shoulders: in place of skis or snowboards rested old-fashioned, metal grain shovels. 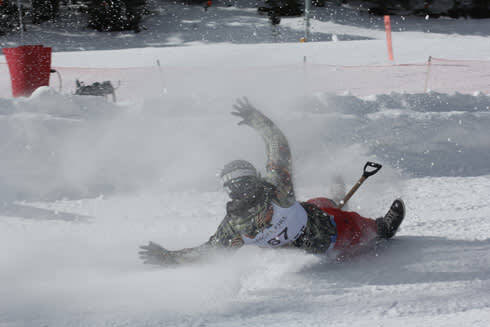 Shovel racing originated on the slopes of New Mexico’s ski resorts in the 1970s, when lift workers grooming divots realized they could use their tools to get from one place to the next. Over the next 20 years, this mode of transportation evolved into an amped-up sport, featuring tricked-out shovels that could easily hit 90 miles per hour. After a short stint in the ’97 Winter X Games—and the accidents that ensued—modified shovels were banned. Now that racing has returned to its roots with the original shovel (the kind you pick up at Home Depot for $30), some diehards who long for the NASCAR-on-ice days complain, “It’s just not what it used to be.” But to any greenhorn like me, it’s exciting. Four out of every five racers I watched wiped out before the finish line. Those who did make it past were quickly pinballed into three layers of netting, getting a mouthful of snow—and shovel—in the process. Most racers were first-timers, or just goofballs in it for the show. Between all the capes, Elvis wigs, Speedos, hula skirts—and, of course, flames—it was hard to tell who was competing for best costume, and who was seriously racing for the sport of it. The only way I could tell was by how each racer finished. True racers wiped out with the elegance of a figure skater turned football player, combining a touchdown wiggle with the most triumphant shovel raise, the crowd cheering as if the U.S. had just won an Olympic gold medal. One even kissed his metal seat of glory as he posed for his fans. Most serious riders are members of the second or third generation of their families to dare it. Shovel racers are celebrities in this town, even if only for a weekend. If you let them, they’ll gladly sign your posters, or even your shoulder, with a Sharpie. My first run-in with the medalist crowd came shortly after the races had ended, at the Award Ceremony and afterparty—which I recommend almost as much as the race itself. The entire community packs into the Village Haus, the rowdy bar that sets the tone for Angel Fire’s après-ski, to watch each age group’s medalists stand on milk cartons to receive their prizes. Sometimes, an ecstatic winner breaks out into speech: “I owe it all to my secret sauce and magic dust!” After each award, the 10-by-10-foot dance floor swarms with racers. (Using a shovel as a partner is commonplace.) Before long, I was asked to dance. “I don’t know if you recognize me,” my suitor said coolly, rubbing the bronze medal around his neck, “but I just got third place today.” I tried to fight back my laughter as he showed me a grisly five-inch scar from the previous year’s race. Fans are also, well, fanatical. They’ll drive 500 miles just to get their shovel signed by the world-record–setting Chad Jones. Without even knowing a racer—or where he placed—they’ll raise him onto their shoulders and buy him a beer or three. To call it enthusiasm is an understatement. Fans hoot and holler for shovel racers as if they were cheering for their own sons and brothers.